Loaded with vegetables and then simmered until tender, rich in tomatoes and Italian flavors, this soup was enjoyed by the whole family. 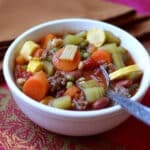 Italian Vegetable Soup is one of my family’s favorite soups. It was actually the very first recipe I posted on this blog. We eat it year round and it can always be found in our freezer. My husband has been taking it to work for lunch at least once a week for years now. The very first Baby Crooknecks from the garden!! 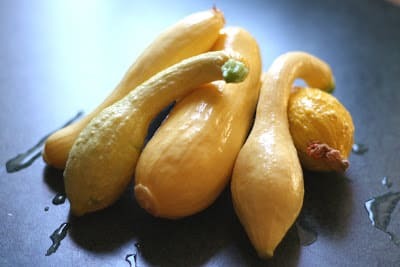 As soon as our first squash was ready to harvest in the garden last week, I decided to change our soup recipe up a bit and include the squash and few other new things. I’m sure to be making this soup again with the plethora of squash that will be in my kitchen throughout the next few months. In the bottom of a very large stockpot, heat the oil over medium high heat. Add the onions and saute until translucent. Then, add the ground beef, cook and crumble it. Add all remaining ingredients, EXCEPT for the corn, peas and squash. Bring to a boil. Reduce the heat and simmer about half an hour, until the carrots and celery are almost crisp tender. Add the corn, peas and squash and bring back to a simmer just until the squash is almost tender. 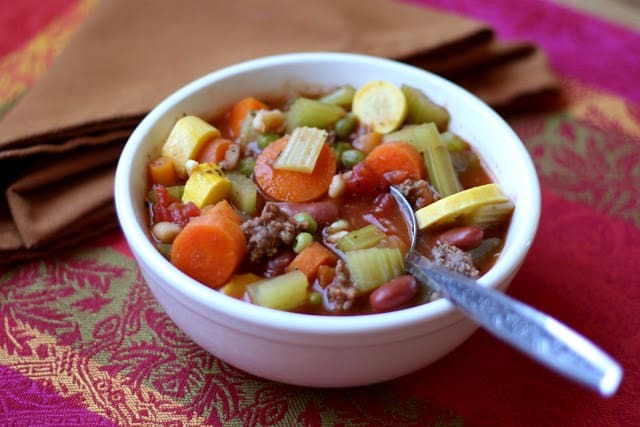 If you are planning to freeze this soup, leave the squash a bit more crisp. Taste and adjust seasonings as desired. If desired, top individual servings with cheese. Enjoy!